Bankers are giving Parasites a bad name. Over the last few years, parasites have taken a bashing. Never a week goes by without some below-the-belt, negative reference. Now I’m not saying that parasites are all without fault but to be fair, a parasite has no choice but to parasitise… its about survival. Causing governments to bail out the banks because of fraudulent practices which resulted in governments having to get loans from the International Monetary Fund. Selling unsuitable 8.5m endowment policies for repaying mortgage loans, with 60% of borrowers faced a shortfall of around £40bn. Mis-selling private pension schemes – a £13.5bn scandal affecting some 1.4 million people. Getting 250,000 retired people to invest £5bn in Precipice Bonds, misleadingly described as low risk, causing thousands of investors lost 80% of their savings. Selling 3 million people expensive and unnecessary Payment Protection insurance, with potential compensation topping £10bn. There is also no evidence that a Parasite has any concept that it might be doing another harm…. Parasites are not greedy. It is inconceivable that a Malarial trophozoite would want more than one red blood cell to develop in, or that a tapeworm would absorb more pre-digested host food than it needed…. Whereas Bankers receive huge complicated compensation schemes and bonuses in order to be able to use every available tax avoidance device and tax haven scheme. So not only do Bankers receive vast amounts of money but they also deprive citizens of tax to pay for the NHS, Education, other public services, benefits and decent pensions. On top of this, when the banks failed in 2008, their losses were guaranteed by government, thereby ‘socialising’ their losses. The banks were bailed out, and yet still managed pay themselves huge bonuses and avoid paying a proper amount of tax. For example, in 2008, Goldman Sachs received a $24 billion bailout from taxpayers, yet the company only paid $14 million in taxes worldwide. Best evidence to date suggests that Parasites are not interested in gaining political power, or holding their hosts to ransom by threatening to leave (now there’s a thought). Whereas Bankers employ many lobbyists, and support financially organizations, like Atlantic Bridge of Liam Fox/Werrity fame, whose only purpose is to influence government legislation in favour of the banking system and other transnational corporations. Banks have also used their financial ‘welly’ to gain disproportionate power over the global economy. 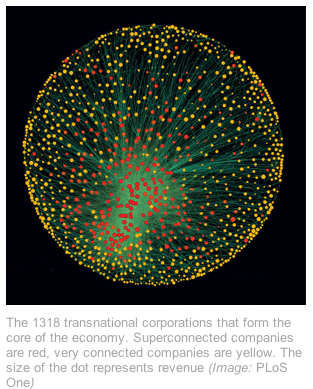 Using a mathematical model for studying natural systems, complex systems theorists at the Swiss Federal Institute of Technology, analysed the relationships between all 43,000 transnational corporations and identified a relatively small tightly knit group of 147 companies… most were financial institutions. All were owned by other members of the super-entity and controlled 40 per cent of the total wealth in the global network. Parasites have also never promoted warfare whereas FactsAboutTheWealthy ‏@WealthyFacts report that a 2001 survey found that 93% of wealthy individuals support any war which will open up new markets for corporations. Parasites are considered to be beneficial in some ways to host communities, just as bankers are when they provide useful services. For example, when they lend to small businesses or in creating mortgages. Parasites are said to ‘fuel’ evolution because they create a selection pressure for the host species to evolve strategies which avoid or minimise being parasitised. There is also evidence of cross-resistance being conferred such that the infected host may be more resistant to infection from another species or pathogen. For example, the malarial fever can cure Gonorrhea. But most importantly, parasites induce a level of antibody production and that is what needs to be developed against the ‘naked, raw, aggressive capitalism as practiced by investment bankers consuming the value of their shareholders.’ (11) The 99.999% would also benefit by developing some ‘cross-resistance’…..extrapolating from the behaviour of the banks to other areas, like the involvement of private corporations in health, education, public services and in the financialisation/commodification of the environment. Irritatingly, some economists, historians and David ‘two brains’ Willetts, try to draw erroneous, crass analogies between the ‘benefits’ of competition, capitalism and Darwin’s concept of ‘survival of the fittest’. In fact, intra-specific co-operative or altruistic behaviour is much more the rule in biology… a trypanosome has no investment in trying to pull a fast one on another trypanosome. (Although both will bind host antigens on their surface to avoid eliciting a host response… a real cloak of invisibility… which is a bit like the secretive collusion of the power elite which has been revealed by the Leveson Inquiry). The big problem with an exclusively co-operative utopia is that it creates an ecological vacuum… an opportunity for individuals or a species to develop a ‘cheating’ or parasitic mode. With this in mind, the ethologist Robert Trivers talked about the imperative for ‘moralistic indignation’ to be triggered when such exploitation occurred… a sort of ‘social antibody’ to be mobilised whenever an individual, or group, tries to take much more than their fair share. And stop the name-calling. No parasite deserves to be called a Banker! This entry was posted in Uncategorized by syzygysue. Bookmark the permalink. Endless bailouts for parasite bankers, yet another violation of our rights. The gov’t constantly violates our rights. Parasites NEVER eliminate their host species, pray upon themselves, destroy their environment, horde or take more than they need. In fact, no known creature in the universe takes more than it needs, except a few humans that devised a conceptual systems leading to self-destruction, we call them, in our modern times, international bankers.